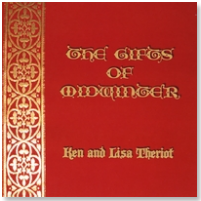 We just received a review of Ken and Lisa Theriot’s Christmas Album, “The Gift of Midwinter.” It is a wonderful summary of this unique album of Christmas songs, and is to be published in the newsletter of a group in The SCA (world-wide medieval re-creation group). Below is that review. Many thanks to Lee Anderson and the good folks in Stierbach (in Virginia)! Cold weather has come to fair Atlantia’s shores. The time to gather round the Yule log with friends and family is upon us. If your hearth lacks a bard, Ken and Lisa Theroit provide a delightful collection of fifteen songs for your seasonal celebration. Three are period pieces in Latin: “Gaudete,” “Puer Natus,” and “Personent Hodie.” Lisa provides both the Latin and English translations of these in the lyric & line notes. Three are in French: “Cantique de Noël,” “Noël Nouvelet,” and “La Marche Des Rois.” The latter two are in period also, and Lisa has the words in both French and English. The only Spanish song on the album “Riu, Riu, Chiu,” has very little in the way of musical accompaniment, but you’ll find yourself clapping and singing along. In English, the remaining songs include the recognizable Christmas carols “Do You Hear What I Hear” and “How Far to Bethlehem.” There are three period Christmastime songs that you may not be familiar with, including the lullaby “This Endris Night,” the danceable “The Boar’s Head Carol,” and the Corpus Christi Carol “Lully, Lully.” “Marmion’s Christmas Song” is Lisa’s expansion of a holiday scene in a poem by Sir Walter Scott.